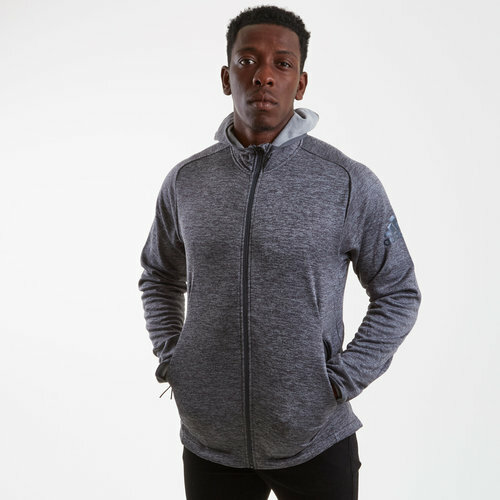 Feel supported and insulated in this adidas FreeLift Climawarm Full Zip Hooded Training Sweat in Solid Grey. Make sure you stay warm and train to an all-time high during those cold weather training sessions with this hoody. Made from premium heathered fleece, it is a lightweight sweatshirt that offers breathable insulation to help the wearer stay dry and warm in all weather. The supportive stay-put fit and a drop-tail hem combine to keep you covered and moving freely throughout rigorous outdoor sessions. This jacket comes in a regular fit so it is wider at the body.